Founded in 1979, the Society for Medical Decision Making (SMDM), is a not-for-profit, professional research organization of approximately 1,000 members worldwide. We promote scientific and methodological rigor in health care decision research and its application to health policy and clinical care. We promote an analytic, transdisciplinary, integrated approach to health care decision making in an inspiring, energizing, respectful, collegial, and friendly learning environment. SMDM is the leading society for studying and advancing decision sciences in health, including incorporation of patients’ values and preferences. We bring together experts from numerous fields, including economics, psychology, sociology, education, communication, mathematics, organizational theory, clinical epidemiology, public health, and clinical medicine. The mission of SMDM, reflecting this interdisciplinary approach, is “to improve health outcomes through the advancement of proactive systematic approaches to clinical decision-making and policy formation in health care by providing a scholarly forum that connects and educates researchers, providers, policy makers, and the public”. Our annual North American and Biennial European Meetings are the major catalysts for scholarly exchange. The meetings are forums for presentation of novel research of various methodologies, including decision analysis, meta-analysis, predictive modeling, disease progression modeling, cognitive psychology, shared decision making, quality of life assessment, utility elicitation, health outcomes assessment, cost-effectiveness analysis, health economics, pharmacoeconomics, technology assessment, evidence-based medicine and medical informatics, among others. 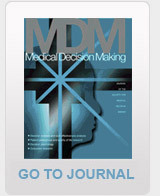 SMDM publishes two peer-reviewed journals: Medical Decision Making focuses on methodological work and systematic approaches to decision making, and MDM Policy & Practice, an open access journal, focuses on applications to problems facing health care decision-makers, including patients, providers, producers, and payers. A major initiative of our editorial office is to train and incorporate patient reviewers into our manuscript review process. SMDM’s mandate includes activities to expand the knowledge and use of medical decision making techniques beyond our membership. We have developed curricula that provide a broad introduction to topics in medical decision making, including modeling and shared decision making. We offer these courses at each of our scientific meetings and, with the support of grant funding, are able to offer onsite trainings to researchers, clinicians and other stakeholders who are unable to attend SMDM meetings. To date, SMDM has provided training to a number of groups, including: the U. S. Veterans Administration, the U. S. Food and Drug Administration, the American Urology Association and other government entities and educational institutions.